Life really is a beach here! We work closely with so many lovely people, bloggers, press and clients we email and speak with daily! So, we decided it was only fair to have a little insider knowledge into Life at bump… have a little read – you’ll soon see it really is a beach at bump! 1. How long have you been here? I have been here for around 2 months! Bump is such a friendly place to work, as well as all the lovely products; the bloggers are also a real treat to work with too! I LOVE Vital Baby’s Facebook page, which I enjoy running. 5. Funniest moment at bump – My funniest moment has to be when we couldn’t find the fan and were working in 100 degrees heat! 9. What album would you listen to if you were by yourself in the office? I would probably put on a really happy playlist instead of an album – something I could sing along too. 1. How long have you been here – I started in March 2012 – so about four and a half years! 2. Why you love it (hopefully you do), – bump is quite simply, a lovely, friendly and down to earth place to work. We work really hard, but we have such lovely feedback and it’s great to build relationships with some amazing people in the industry. By its nature, the world of parenting is a very nice place to be! 3. Favourite project you have worked on – Seriously there has been too many! I can’t possibly decide – I always love compiling our annual bump Christmas Gift Guide though. 4. Best bit of a bump day?? – Obviously when someone says they have brought it a bake of some sort – diets are always off! 5. Funniest moment at bump – I particularly enjoyed it when Toby went into Emily’s drawer and found her hidden stash of Hotel Chocolate treats, which we then insisted we had to share immediately. I also liked it when Bear, one of our office dogs, stole one of the samples and wouldn’t give it back. 8. What’s your favourite Bump snack – hmmm it changes all the time … Percy pigs, eclairs, cherries… depends! 9. What album would you listen to if you were by yourself in the office? – Bruce Springsteen – all day long! 1. How long have you been here – I was here for just over a year in 2014 and now I have been back for three months! 2. Why you love it (hopefully you do), it’s just the nicest, friendliest place to work! We work with amazing clients, bloggers, journalists and celebrities and of course everyone here in the office is fab… So my days are just filled with loveliness (and cake)! 3. Favourite project you have worked on – There has been so many amazing projects I can’t pick. Arranging all of the samples for our new brand Piccolo has been very exciting, but generally I love it all! 4. Best bit of a bump day?? Hmmm I always love it when the magazines arrive, but my favourite is Friday afternoon when we usually have a musicals playlist on! 5. Funniest moment at bump – Dancing front row to five at the Mother and Baby Awards. It was surreal to say the least. 6. Favourite Chilli B’s sandwich (bump’s favourite lunch) – Bangkok nights is a favourite of mine. Can’t beat a bit of Thai chicken in a sandwich! 8. What’s your favourite Bump snack … Mimi’s chocolate brownies or Jack’s caramel shortbread! 9. What album would you listen to if you were by yourself in the office? Probably Adele, 19 or Beyoncé Lemonade. 1. How long have you been here -Since the very beginning… 6 and a half years ago! 2. Why do you love Bump PR (hopefully you do) – Toby has trumped the top spot, but it is quite simply my baby… Nurtured and loved from the very first email I wrote, and I still with the same passion and commitment! And never forgetting my amazing team who I’d be lost without! 3. Favourite project you have worked on: Goodness, I couldn’t pick! I only work with clients I like which makes me so very lucky! But one thing that is special to me is the fact for many of our clients we have such wonderful long term relationships… Working with Medela, The Little Green Sheep and smarTrike for over 6 years certainly you develop some amazing campaigns… But I literally love all our clients and the work we develop and progress for them is a pleasure! 4. Best bit of a bump day?? The first cup of tea, I always have such positivity and hope I’ll get my to do list completed… But never do! 5. Funniest moment at bump: For me it has to be when someone said their email was bouncing back… The issue became clear when he told me he had emailed Lisa at bum PR! Oh and my office hen party when both girls got so drunk I had to put them in cabs home!!! 6. Are you a tea or coffee girl? Tea in the morning but as the day progresses often coffee is brought into force! 8. What album would you listen to if you were by yourself in the office? Spice girls best of or Take That… I’m a 90’s pop girl! 1. How long have you been here for: 18 months? 2. Why do you love Bump PR (hopefully you do) It is always busy! I don’t think I have ever looked at the clock, the days fly by in the best way! We work with such cool brands and all genuinely love what we do. 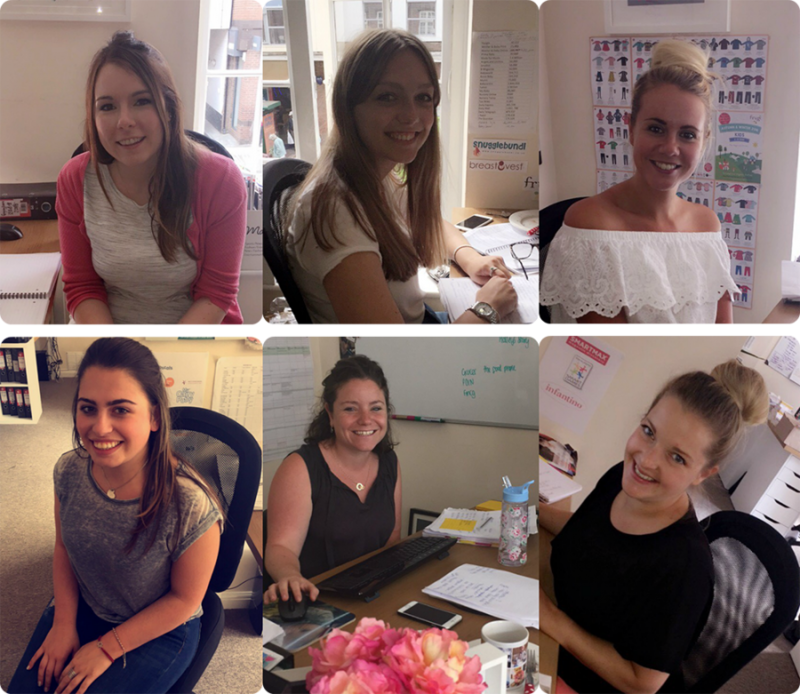 The team are lovely and the office is always a fun place to be! 3. Favourite project you have worked on: There are so many….but this year I would have to say Medala’s Big Breastfeeding Cafe. To be able to engage so many lovely mums across the UK in both the brand and breastfeeding was just amazing! 4. Best bit of a bump day? The 11am tea round – without doubt, there is always a cake, biscuit or treat of some sort to enjoy! 5. Funniest moment at bump: This is a tough one…most probably when we discovered George had a (secret!) bag of cookies in her drawer. Needless to say, they didn’t last long! 6. Favourite Chilli B’s sandwich (bump’s favourite lunch) Texas Chainsaw Moussaka – chicken, chilli and chargrilled vegetables! 7. Are you a tea or coffee girl? Tea! 8. What’s your favourite Bump snack: It has to be Costa Coffee Hot Chocolates with Marshmallows on cold winter mornings. 9. What album would you listen to if you were by yourself in the office? I do love a soundtrack – Hairspray is a big favourite at bump! Otherwise, Dolly Parton! 1. How long have you been here? – 1 Day! 2. Why you love it (hopefully you do) – Although my time here has been short, but sweet (a day! ), I already know that I am going to love the super team and awesome clients. 4. Best bit of a bump day – Seeing the team in the morning, and of course tea and cake. 7. Are you a tea or coffee girl? – Tea for me! 8. What’s your favourite Bump snack … Cliché, but anything chocolate related. Here? You mean on the sofa… about an hour. At Bump, about 6 years lurking in the background! I’ve watched it grow from just Lisa in her parent’s spare room when we first met to a seven strong team today. There is such a lovely atmosphere in the office, Toby and I like to drop in and distract everyone even when it’s not one of my work days! Renovating the office. It’s gone through such a change since we took it on. It’s now a lovely space to work in. Chilli B’s! – Our local sandwich shop, it’s awesome. I’d eat them for every meal if I could. Probably when I dropped in one day with a friend back when the office was in London and over the intercom pretended to be from HMRC to do an on the spot audit. I think Lisa nearly had a heart attack. I should point out; all accounts are in order here! Or, when I left a post-it note on Chloe’s desk telling her to call Bob and left a made up number… oh she was confused for weeks! 9. What album would you listen to if you were by yourself in the office? I would probably have Radio 2 on rather than an album.